JayWalk - All Your Xmms Are Belong To Me: Tomato Beer? I landed at Narita airport and there was a 2 hour wait for my next connection to San Francisco. 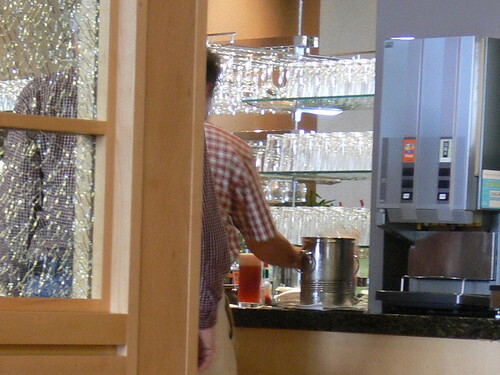 With time to kill, I headed over the the Northwest Airlines World Club lounge to grab a drink and a bite. So there I was with my laptop plugged in and a drink at table-side, I spotted this guy with a beer and I sensed something amiss when he reached for the pitcher of tomato juice. I grabbed my camera on this hunch and I was right, he poured the tomato juice into his beer? WTF?? I related this story to my aunt and she chided me for making a mountain out of a molehill for she said that there are people who drink this concoction. In fact, she just did it (Beer with V8) the night before. If it were me, I confirm Lao Sai one. I try if I can put a message... good day jaywalk..
sunflower: I was just talking about this with another friend and he too saw two other guys (Vietnamese) drinking this foul concoction happily on another occasion. Yuck!